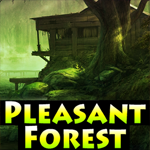 Games4King - G4K Pleasant Forest Escape is another point and click room escape game developed by Games 4 King. Assume that you went to a pleasant forest to capture a queen bee. As the forest is a pleasant place for hiding for many creatures, so the queen bee also hides inside the forest. So use your skills to collect the necessary items in the forest to find the queen bee from the pleasant forest. Good luck and have fun! how do i find last gem?